Thomas Frank Martin was born in 1943 in Chicago, Ill., where he attended parochial elementary and high schools. On Sept. 3, 1961, he became a novice in the Order of St. Augustine and spent a year at St. Monica Novitiate, Oconomowoc, Wis. He professed his first vows on Sept. 4, 1962, in the Province of Our Mother of Good Counsel, and then atteded Tolentine College, Olympia Fields, Ill., where he received his BA in Philosophy in 1966. Father Martin was ordained on Dec. 20, 1969, in the chapel of Tolentine College. He earned his MA in Theology from DePaul University, Chicago, Ill., in 1970, and a PhD in Early Christianity Studies from Northwestern University, Chicago, in 1995. Father Martin led an active life; his first assignment was as a teacher and chaplain at Mendel Catholic High School in Chicago. From there he became the formation director at St. John Stone Friary, Chicago, and, when the program moved to Villanova University, he came here. Next he served a brief time at Cascia Hall, Tulsa, Okla.; he left Cascia Hall when he was elected Province Secretary and returned to Olympia Fields. From there he was called to Rome where he served the Order from 1984-1990. He came back to Chicago in 1990, serving once again as the formation director at St. John Stone Friary and studying for his PhD. 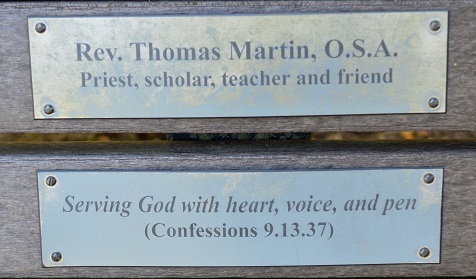 After earning his PhD, Father Martin came to Villanova to teach in the Dept. of Theology and Religious Studies, 1995-2009. 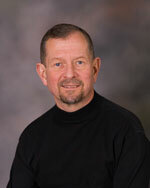 He was the founding director of the Augustinian Institute (2001-2009). And in 2003, he founded Reconsiderations, a scholarly conference to discuss St. Augustine, his life and legacy. 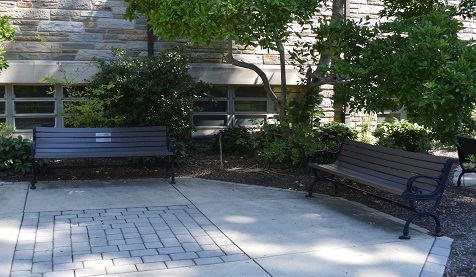 A comfortable bench in a shady spot, a place to sit and read or think, adjacent to the Library which houses the books he wrote as well as a large collection of works related to St. Augustine – what an appropriate way to remember a much loved “priest, scholar, teacher and friend.” The bench with its plaques was installed in spring 2009. A video of “Augustine’s Pauline Method 1 Cor 11 2 ff As a Case Study,” a presentation by Father Thomas Martin. Bench photographs by Alice Bampton, Communications and Marketing Dept. Photograph of Fr.Martin courtesy of the Order of St. Augustine.